Have you ever found a great restaurant and felt like not telling too many people about it because you were concerned that it would attract so many customers that you’d have a problem getting a table again? Well, to me, M’s Italian Cuisine is that type of special place. It’s located just a few feet up Soi 3, off of Suthep Road. Suthep is west of Huay Kaew Road, all the way down Nimmanhaemin. Take a right up Suthep, past Canal Road, a little over a kilometer, then take a left, just about 30 yards before the road that takes you past Chai Blues House, to Wat Umong. Chiang Mai University is just across Soi 3. If your transportation is hired, just dial the number below and let your driver speak to the restaurant for directions. There is a parking lot right in front of the restaurant, large enough for about a half dozen cars. M’s is an open-air restaurant, in a garden setting. I’ve been to M’s several times and every dish I’ve tried has been very good to excellent. The owner/chef, Khun Manoon, told me he worked at one of Chiang Mai’s hotels around 10 years ago. 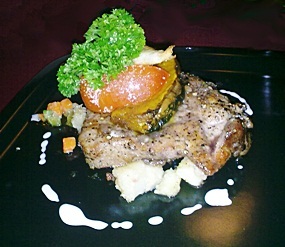 The food is not only tasty and reasonably priced, but very attractively presented. Recently, I returned with a group of around 10 friends, most of whom had been to M’s at least once before. I usually order their Fettuccine with a Parma Ham in cream sauce. The dish comes with a small mixed salad and a slice of toasted and buttered French bread, all for just 110 baht. 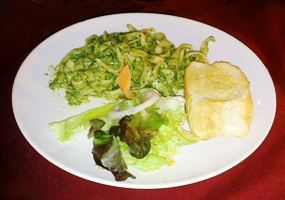 This time I tried the Fettuccine with pesto sauce, which was also excellent. I split a very good Caesar Salad (70 baht), which comes with a slice of the French bread, and had their house red, which was good, for another 70 baht. Their soups are very special. One of my friends loved his bowl of Cream of Chicken Soup (50 baht) so much that he had to go back the next day for the same! I’ve tried it myself on an earlier visit, and I must agree it is excellent. Next time, I’ll have to try their Minestrone. My vegetarian friend had the 8” Margarita Pizza, with a tomato sauce and cheese, for 110 baht. She said the pizza tasted stone baked, with a good quality flour that created a base that had a crispy but chewy texture. The topping was light, but of good quality with a non-stringy cheese and a tasty tomato base. Another friend had the Bacon and Spinach Pizza for 120 baht. He also raves about their Salmon Pizza (140 baht) that he had on a prior visit. Each pizza is sized right to make a great appetizer for two or four, depending on who orders a salad and/or soup. Two other orders were the Pesto Ravioli with Spinach and Ricotta (130 baht) and the Chicken Breast with a Prune and Raisin Sauce (150 baht), served over potatoes with a large sautéed mushroom slice, the small mixed salad and slice of French bread. I was told both entrées were very good and tasty. I didn’t notice Veal Parmesan on their menu but there are spaghetti and lasagna entrees, none of which I have tried, to this date. Also, if you like grated parmesan cheese sprinkled over your Italian foods like I do, it is available, if you ask. Avocados add that little touch of exclusivity to any meal. This is a very simple dish you can make beforehand, and then dazzle your guests with a gourmet-style appetizer. The only ‘trick’ is to select ripe avocados at the market. A slight softness on firm hand pressure will indicate ripeness. Retain the avocado in its casing and then fill the avocado with the crumbled bacon. Having brushed with lemon juice, the avocado flesh will not discolor and they can be put in the refrigerator. Before serving, combine all of the remaining ingredients and gently heat to boiling to produce the sauce. Remove avocados from the refrigerator and then drizzle the hot sauce over the avocados, give a twist of the pepper grinder over each and serve immediately on four individual plates.